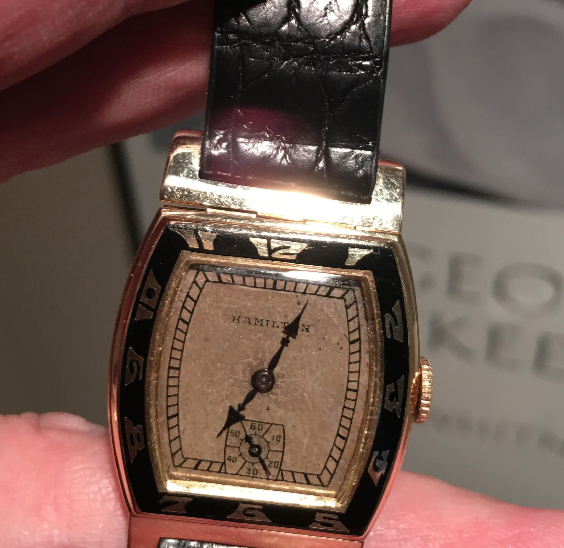 Two very popular, and expensive, early Hamilton wrist watch models were the 1928 Piping Rock and the 1930 Coronado. Both models were produced mainly in solid 14K white or yellow gold (although a handful of 18K yellow gold and platinum Piping Rocks were made, including for Tiffany & Co). One of the unique attributes of the Piping Rock and the Coronado is they each feature moveable hinged lugs so the case wraps to your wrist. They also feature very plain dials accented by numerals highlighted by black enamel on the bezel. Of the two models, the Coronado is much scarcer and harder to find. I've featured both models on the blog already but I recently rejuvenated a yellow Coronado. Since I've shown the model before I didn't take a lot of photos of the process. Only approximately 1,540 yellow Coronados were produced so it's definitely a rare model. 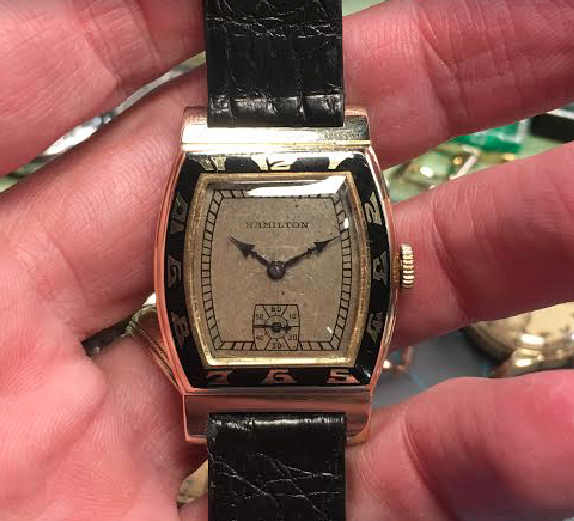 As I reassembled everything, including a new glass crystal, new mainspring, new set lever, new crown and a fresh alligator strap with new female spring bars, I thought the finished watch turned out fantastic! Then my heart sank when I realized a portion of the upper hinge was broken! The left side would lift off and only the right side was actually attached. The hinges on the Coronado and the Piping Rock are just like door hinges in your house. They consist of two sides joined together by a rod going through each section. Over time the rod can corrode, wear, weaken and eventually break. It's not an uncommon problem unfortunately, and I've seen examples for sale that have been really buggered up in attempts to repair the issue. Lance was able to replace the rod in the upper hinge and restore this beautiful Coronado to showroom -like condition! I highly recommend his talented services if you have a challenging case problem.